Many residents and elected leaders from the neighborhoods near the Barclays Center in Prospect Heights are letting out a sigh of relief after steeling for gridlock this weekend. Sellout crowds for the arena’s first events — three Jay-Z concerts — did not completely overwhelm nearby neighborhoods with traffic, but the strain on local streets was still clear. “It wasn’t as bad as we expected,” Danae Oratowski, chair of the Prospect Heights Neighborhood Development Council, told Streetsblog. Despite the relative smoothness of the arena’s opening, there were rough spots. Early indications show that the share of event-goers taking transit may not be as high as predicted during the arena’s planning, while free curbside parking on local streets seems to be irresistible to many drivers looking to avoid paying at parking garages and lots. Sidewalk space fell short of what was needed to handle the number of pedestrians, especially when the concerts let out, which led police to close Atlantic Avenue to vehicles in order to accommodate crowds leaving the arena. After the concerts ended on Friday and Saturday, NYPD barriers proved to be ineffective crowd control, as sidewalks filled up near the intersection of Flatbush Avenue and Dean Street and along Atlantic Avenue. Presently, there is no crosswalk for people leaving the arena’s mid-block Atlantic Avenue exit. “The sidewalks are too small to accommodate the crowd,” said James. A large portion of concertgoers got to the event by subway. Turnstile exits at the recently rechristened “Atlantic Ave-Barclays Center” station increased 6,754 in the four hours before the show compared to other Fridays in September, according to MTA data analyzed by WNYC. If all of those additional riders were going to the Barclays Center, they would make up approximately one in three concert attendees at the sold-out 19,000-seat arena. The increase calculated by WNYC does not include people who used other nearby subway stations, buses or LIRR service. The arena’s traffic forecast, prepared by Sam Schwartz Engineering, predicted just under half of attendees would arrive by subway, with six in ten arriving on foot or by transit. Oratowski said that the Jay-Z concerts attracted “a very young crowd” that was more inclined to take transit. “That may not be the case going forward with things like the Barbara Streisand concert, or even a Nets game,” she said. Of concertgoers who drove, few used the arena’s parking lot, located between Vanderbilt Avenue and Carlton Avenue. The lot’s 541 spaces, which cost approximately $26 each, are limited to cars with three or more passengers. Another 150 free spots are reserved for VIPs. Over the weekend, the lot was barely a quarter full during the concerts, according to separate observations from reporter Norman Oder of Atlantic Yards Report and Council Member Steve Levin. Most drivers are choosing to park elsewhere. For tonight’s concert, charging between $20 and $41 per space, three nearby parking lots are sold out. Five other nearby lots have spaces, as do six remote locations with shuttle service. Harder to measure is how many people are cruising neighborhood streets searching for free parking for Barclays Center events. “I didn’t get a lot of complaints from residents that they didn’t have parking available,” said James, who, along with Levin, had advocated for a residential parking permit program, before DOT ruled it out. Black cars and limousines, however, were a noticeable sight on nearby streets during the concerts. For-hire drivers were directed to wait on Fort Greene Place, which quickly reached capacity. “The black cars and the limos are just so apparent that we can easily identify them on residential streets,” said Oratowski. “We saw a lot of black cars circling,” double-parking, and parking illegally, she said. Oratowski said the Prospect Heights Neighborhood Development Council is working with Community Board 2 and merchants on Flatbush and Vanderbilt avenues to change meter hours, rates or time limits so parking remains available for business patrons not going to the Barclays Center. “If the community’s interested, we’re happy to work with them,” DOT’s Chris Hrones said in July. In 2009, DOT implemented its PARK Smart parking meter reforms — bringing meter prices more in line with demand — in nearby Park Slope. DOT is scheduled to meet in November with a quality-of-life task force to assess a wide range of transportation issues after the first weeks of the Barclays Center’s operation, according to James. 1) I’d be careful about drawing too many conclusions based on data from one subway station. I’m sure a good number of people took the C or G trains to get there, as those lines serve a big section of Brooklyn. 2) I think the low use of surface lots has everything to do with the high price, and it’s been shown time and again that demand for parking in transit-rich areas is highly elastic, rising and falling alongside changes to the price and availability. If the arena wanted to, it could probably fill up a 10,000 space lot by making it free. It could also be perfectly fine with zero parking. What I’m saying is that I’d be very careful about complaining about the high cost of parking. There is already an element of the public that thinks the solution to high demand for parking is to build more parking lots, instead of encouraging a shift to other modes. Ok, cool, so they can tear down a bunch of the unnecessary parking space… win! BTW, 150 free VIP spots, … wtf?! Sunday was a real test because you had the factor of the “Atlantic Antic” crowd leaving as the Barclays crowd was arriving. That said, the real acid test will be when express service has to be ended early to accommodate concertgoers or Nets fans leaving. Why would they have to end express train service early? Extending express service later in order to accommodate fans heading home would make more sense. The B, Q, 2, 3, 4, 5, D, N & A are all expresses at some point, though only some are Express south and/or east of Atlantic Ave. Only the C, G and R near there are never expresses. one shouldnt think of express service as faster service. (okay a small margin faster), but it increases capacity on trunk lines. also has anyone even considered that 12 out of the 22 subway lines are running through the barclays center area. wow. talk about good mass transit. oh, and i totally forgot about the LIRR too. does it even make any sense driving? 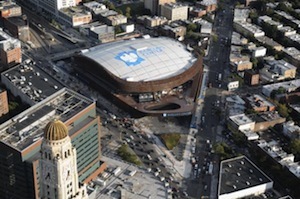 While I was upset by the eminent domain abuse, the thing about the Barclay’s Center location, is that is probably the best possible place for such an arena. All those train lines can bring in or move out thousands of patrons every few minutes. The capacity is enormous. Also, many people on the 2/3 would have gotten off at Bergen, since it is equidistant. To really judge the transit share, we’d probably have to look at the number of people getting off at Atlantic / Lafayette on the C / Fulton on the G and Bergen on the 2/3. Also, a great undocumented mass transit option along Flatbush are dollar vans (actual cost, $2). Many times heading home from DT Brooklyn I opt for a dollar van because the frequency is so much higher than either trains or the B41 bus. I overheard a dollar van driver this weekend was talking about how busy he was before and after the show. I would love to get an idea of how many people got to Jay-Z’s show by (2) dollar van. It may not be legal, but it is how a lot of people along Flatbush Ave get to DT Brooklyn. There is also the LIRR. Not much for Jay-Z, perhaps, but perhaps a big draw for other events. And it appears the Nets may have a better record than the Jets and Mets this year. If anyone needs further proof that the 78th Precinct doesn’t care for its own population, it is the fact they would rather run over locals than inconvenience long-distance visitors in their cars. When will the NYPD stop directing oncoming traffic into unsuspecting pedestrians?